Yes, in some very exciting news Hammersmith Chess Club has been contacted by a production company who are working with Channel 5 in the UK, and are seeking some willing participants to take part in filming for a documentary focused on bridging the generational divide. The show will be a 4-part series, involving a senior citizen being paired with an 18-22 year old over the course of a few days, to see what they can learn from each other, and understand a bit more about each other’s lives. 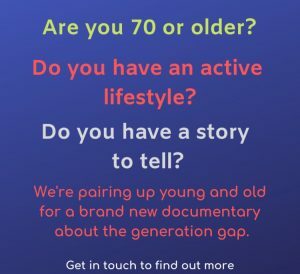 Filming commences at the end of February, and the production company are looking for active participants, over the age of 65, with a story to tell, and a willingness to participate with today’s youth! Having spoken to the producers, we’re offering it out to the Hammer faithful – what an opportunity to promote the club, and spend an enjoyable few days making television! It will be London-based, you’ll be well looked after, and you’ll get on TV! If this sounds like something you’d be interested in, or you know someone who would be interested, please drop us a line – updates@hammerchess.co.uk – and we’ll put you in touch with the producers.